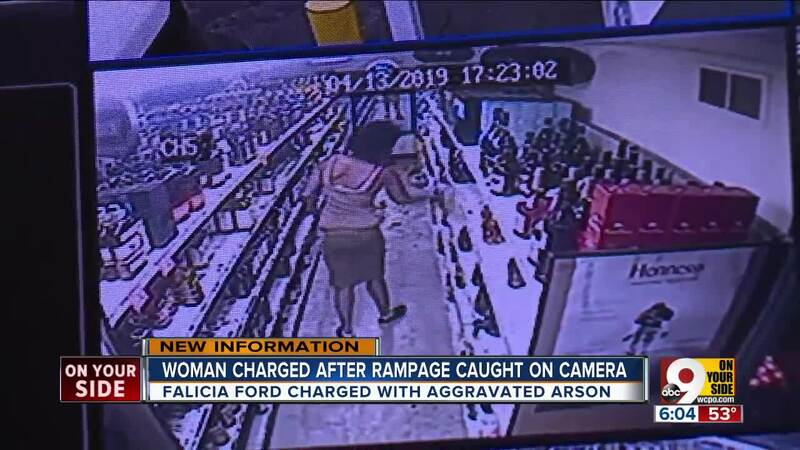 CINCINNATI — Falicia Ford is charged with aggravated arson, vandalism and criminal damaging after trashing three different liquor stores and setting fire to one of them Saturday evening. Investigators say she did hundreds of dollars in damage at each of the locations she destroyed. Court documents say Ford destroyed property and merchandise inside Amir Mini Market and fled in a vehicle. She later did the same at a Family Dollar store before driving off. At the Airy Pony Keg, Ford walked calmly inside and began to destroy products on the shelves, throwing chips, bottles, and everything she can get her hands on to the floor. She escalated to smashing glass bottles behind the counter, and setting fire to cardboard boxes before she was arrested. Ford is in jail under a bond of more than $250,000, and will go before a grand jury.